Avoid buying costumes made from cheap materials and check the label for information on flammability. This Halloween marks the one year anniversary of Claudia Winkleman’s own personal horror story when her 8-year-old daughter Matilda’s costume caught on fire after brushing against a candle. In the months after the terrible incident, the British television presenter launched a campaign to raise awareness of the flammability of these costumes. Due to her efforts, there are now safety regulations and flammability tests being enforced in the UK this Halloween to assess whether costumes are compliant with the safety regulations. Months after the incident, Winkleman said “I wish I had been dressed as the witch; is mainly all I wish, that it had happened to me… she went up, and I don’t want that to happen to another child.” Winkleman’s message is poignant and it resonates with mothers all around the world who can relate to the presenter’s anguish. 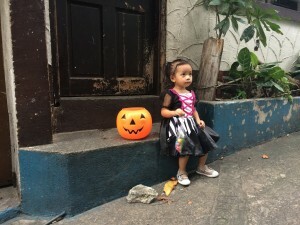 Halloween is celebrated differently across the globe but dressing up is often a common tradition, particularly amongst the younger generation. So how can parents choose a safe costume for their children? Although the UK now take the fire retardancy of these costumes more seriously, this may not be the case if you are living in other parts of the world. Check the label for information regarding the material’s flammability. Wear woollen tights, a woollen jumper or jeans with the costume to create a layer between garment and skin if the material were to catch fire. Avoid lighting candles or sparklers. Be aware that costumes are often classified as toys rather than clothing, meaning the fire safety requirements are not as stringent. Avoid buying very cheap materials; it’s better to buy your costume from a trusted brand name because it is easier to find out their fire safety regulations. If you are handy with a needle, why not have a go at making your own costume for your kids this year? Your children should know that in the event of their costume catching fire, they should stop what they are doing, get on the ground and roll around to suffocate the flame. Don’t talk to strangers – although this may seem like an obvious point which might have your kids rolling their eyes, it’s an important one. If your children are knocking at doors in your neighbourhood, they shouldn’t stray off the marked trick or treating route or knock at the doors of houses which appear not be taking part in the Halloween festivities. Never walk alone – if your children are of a certain age they should always be accompanied by an adult. If your children would be mortified by this suggestion, get an older sibling to go along with them or insist that they remain in groups of at least 4 when roaming the streets. Don’t open the door if you are alone in the house – remember that if you haven’t agreed to take part in the trick or treating this year, remind your children that they shouldn’t answer the door, particularly if they are alone in the house. Don’t provoke “tricksters” – unfortunately there are always rowdy teenagers who can take the fun too far and decide that throwing eggs at your door is hilarious. Remind your children that they shouldn’t provoke these tricksters, especially if they are alone in the house as the situation could get ugly. Halloween should be a fun occasion for both children and parents so long as there are clear rules in place which your children can abide by if they go out trick or treating.